Adventures in Missing the Point? Here is a pretty good article on Mr. McLaren via Will. I think you need to sign up for a free membership or something. Pretty easy. I liked the article, but have to confess that this is a typical mis-direct of what much of this whole Emergent thing is about: It is not that Jesus doesn't require something of you. It is that he requires your whole life, not just your 'spirituality' or your 'religious life'. I was just a little bummed that many of the comments in the article made it sound as though Brian's saying that Jesus just wants to make you feel warm and fuzzy and get your needs met. The truth of the gospel of Jesus is summed in Jesus' own words, "Repent. The Kindgdom of Heaven is at hand." Now, most of us hear the word repent and shreik or shiver, but what it is saying is re-imagine or return even. It is as if there was ultimate goodness at the beginning of time, and Jesus is saying he's come to set things in their proper place and his call to humanity is, "Be part of the problem or be part of the solution of bringing goodness and healing in this world." I think that actually requires more than most religious folks give to Jesus. It means you write off no person. It means you value all life. It means you attempt to live out the dreams and hopes of God in this world. It means you cease to be an escapist. It means you become a part of the solution. It means you better get busy living... really living. Okay, well those are some ramblings that will actually launch tomorrow's post, but that... for tomorrow. Ciao. From the daily White House Briefing Blog by Dan Froomkin. I wrote in Friday's column that Bush will be giving a commencement address next month at Calvin College, a small Christian institution in Western Michigan, highly regarded for its contributions to evangelical intellectual thought. But we -- and possibly the White House -- may have been wrong. On closer inspection, it turns out that Calvin College is not the bastion of the Christian Right it appeared to be. In fact, judging from my e-mail, it's a veritable hotbed of those other Christian values -- the ones that oppose war, work for social justice, and don't think much of the president at all. Professor Kenneth Pomykala, chair of Calvin College's Department of Religion (and a regular White House Briefing reader!) wrote to me that some members of the community "are unhappy with Bush's visit because we believe that Christian values require public policies that seek social justice, compassion for the disenfranchised, human rights, a commitment to peace, care and preservation of the environment, and honesty, say, from political leaders -- in short, policies opposed to the Bush agenda." I believe the Bible was inspired, but that is not really what this post is all about. You see, I believe there is inspiration of God amidst us at all times. I believe whole-heartedly (though at times I strain to) that God is activly at work in this world, redeeming a world that is his/hers. I believe that history is headed somewhere... and that somewhere is not self-destruction and violence and hatred. I believe that when Jesus said that the Kingdom of God is like a tree planted and growing tall that even the birds can perch on its branches, he meant it. And that is what Passover meant to me yesterday. That throughout human history, God has intervened, and has completely changed the direction of humanity. I believe he still does intervene and still is changing humanity. But that is not even all of what this post is about. I think most Christians who try to defend the Bible as 'the only rock solid foundation' in their religion might be deceiving themselves. I mean, if there should be any foundation in Chritianity, it would be Christ himself, wouldn't it?... or even the God behind that Christ, you know? And of course, we need the authors of the New Testament to get good pictures of that Christ, but deifying the accounts themselves? So, I have heard the question: "Don't you believe God is in enough control of the world that he could choose what books are in the Bible or don't you believe that he could make sure they are 'infallible' and authoritative?" And to that I would have to say "yes"and "no"... and I would ask you, "Do you believe in a God that would guide church history in such a way that it could be seen as an infallible and authoritative force in the world?" I mean, Jesus did say that hell itself could not overtake the church and that it would do greater things than he. Do you see that? Hmm. And when did we begin to use words like "infallible" and "inerrant" anyway? In recent history, that's when. So, in defense of the Bible, yes, I believe it is inspired and that it is what it says about itself: that it is God-breathed and useful for living in the way of God, in rhythm with God. Useful. Wow, that's kind of a humble word. So, may you be inspired today by the living God who is in our midst. ...that naivity and idealism are two sides of the same coin. And that is both good and bad. Cheers and have a wonderful Passover weekend. ...that this won't happen in Northern Alaska. If you can't quite makeout what this is, it is an oil-soaked bird. Gandhi's Christian friends taught him the essence of Christianity. They said if he believed in Jesus, he would find redemption. 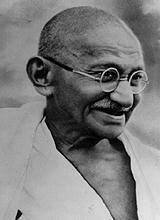 "I do not seek redemption from the consequences of sin," Gandhi replied. "I seek to be redeemed from sin itself." They said that was impossible. Nor could Gandhi understand why, if God had one son, he could not have another. Why could he go to heaven and attain salvation only as a Christian? Did Christianity have a monopoly of heaven? Was God a Christian? Did he have prejudices against non-Christians? My friend Darin says the story of the Good Samaritan is oft misunderstood. It's as if Jesus was telling what a good Jew would look like in their 1st-century Palestinian context... He perused the area and said that a good Jew might look like that Samaritan over there... And earlier this century, one might have asked what a good Christian looked like, and God would have looked across the earth and said, "The best I could find is Gandhi, a remarkable Hindu." An interesting man, that Gandhi. I cannot get past him it seems. So, I see this pattern in my life: Racing at unbelievable speeds, overwhelmed by things to get done, workaholism... and then, nothing... slow-moving, what do I need to do? distracted kind of stuff. I wish I could even out my life a bit: Financially, emotionally, stressfully, work-ully, in everyway-ully. I keep thinking I don't have time to read, but I buy more books. Then I do have time to read, but I don't realize it very well. "Feast or famine," I tell myself and others. But would I have it any other way? I dunno. I think the grass is always greener elsewhere, but perhaps a little balance could be good? Found this video clip. It's a little old I assume, but haunting nonetheless. Well, yesterday, Lisa and Holly and I committed to a 3-day cleanse where we would only drink water, peppermint tea, and this lemon juice/maple syrup/cayenne pepper combo stuff. We committed to doing it for 3-days. I failed first, really. I told them I was caving. And so I took Lisa to Chili's, and we bought 3 take-out burgers. They were so damn good. I failed. Just wanted to let you know. I was listening to NPR this morning, and Neil Conan (Talk of the Nation) was interviewing a few Catholic fellas and taking calls from listeners and so on. One particular caller said that she didn't necessarily agree with the Pope on all matters but still considered herself a real Catholic. Neil Conan came back with, "Well, you're kind of an a la carte Catholic, aren't you?" She replied, "yes." I was stupified by this in some senses because everyone Catholic is an a la Carte Catholic... in fact, I think that every Christian is an a la carte Christian, whether they know it or not. No person (that I have met) really believes that they should do everything said in the Bible. Like those pro-lifers who hated Kerry sure have no problem with the violence taking place to protect our American interests abroad. And those who go to such great to say that they are literal Biblical Christians? What about the charges to dash children on the rocks? Or what about the command to care for the orphans and the widows? Or those who say they believe the same core things that the church has always believed, are they referring to the time that the church believed that the earth was flat and killed those who objected? Or are they referring to the time when Martin Luther said to burn Jewish temples? Or the time that Scripture was used to enforce slavery? Or the crusades? Or oppressive forms of capitalism? All I am saying is that is wish every person in the Christian church could see that they are an a la carte Christian. In fact, I don't see that we could be any other way. First, the movement of Christianity (as with any movement) is broken... because people are broken... yes, even those who wrote the Bible you hold onto... and yes, even those who chose what books would be in your Bible... Second, this movement (and even the Scriptures themselves) show an evolution over time. The way man understood God in Genesis is very different from the later prophets, and even more different in the New Testament. So to embrace all things as "Thus saith the Lord" is to embrace a plurality of viewpoints. And how does that hold for those "absolutists"? Not well. Certainly many Christians will have a defense for this, but I just thought, "There it is. Every person personalizes their religion to their own life." And can't God be in that? I was just browsing through a free TNIV Bible that I got at the Emergent Convention last year... and I was thinking about how I have never heard a good explanation or commentary on the whole, "Let us make man in our image." Does this passage strike no one else as a bit strange? Us? Our? Is this part of the Shemah understanding... that God is One, not in the sense of alone, but in the sense that is is alive in all things? What is included in this "us"? Thoughts? Anyone? In government, for example, no one was held responsible for major failures in intelligence in either the Sept. 11, 2001, terrorist attacks or what former CIA Director George Tenet called the "slam dunk" conclusion that Iraq had weapons of mass destruction. Instead, President Bush awarded Tenet the Medal of Freedom, the nation's highest civilian honor. PS - I am the problem. My consumeristic tendencies, my selfishness, my lack of responsibility... I am the problem. Check these out if you've a little time... So funny. Hey there, just wanted to let you know that we just posted a donation link on the sidebar that looks like the one above. They take you to the same place. I posted this because it makes it easy to just quickly send money. Why would I send money and what are you accepting donations for? you might ask. Two things: First, to help cover a few costs for us going to Thailand this summer. We plan to cover most of that ourselves, but a little help is always nice! Second, and more importantly, to help with projects in Thailand. This last time we were out, we helped start 2 projects and can forsee many more. We are hoping to rally support for these projects. If you would like to be a part of this, but don't want to make a donation now, that's cool. Just email me and let me know to add you to the list of potential supports of our tsunami relief efforts. Also, everytime this donation system is used, it docks us like 4% (because of PayPal fees), so if you would like to make a larger donation, best to email me first. Thanks. Well, I think we would all agree that this is an interesting time in the history of the US and the UN... and I would at least make the leap in saying that this is a very critical time. And somehow I seem to not approve of (m)any of Bush's decisions these days... and somehow this guy Bolton just doesn't seem like the best face to show the world government, you know? I hesitate to put too much value on the UN, but I readily recognize that there is a great need for accountability and a sort of checks and balances in the world today... especially checks and balances on the Bush Administration's America. Well, that's just my 30-seconds of thought on the matter. Barbara Boxer (who I voted for) had some pretty good points about Bolton's past record of being pretty anti-UN... and this is Mr. Bush's best choice for ambassador? Hmm. An article for further reading. So, the last two DVDs I have gotten from Netflix were Control Room and Outfoxed. Documentaries on news networks, specifically FOX News and Al-Jazeera. The first one we watched was Outfoxed. Though not as professional in the edits and cinematography, it was informative and provocative nonetheless. Showing what it means when a multi-billionaire owns so much of the American media, the film pushes the idea that FOX News is a very, very, very slanted news station. There were several interviews with folks who used to work there, their experiences, and their thoughts on this network. It is amazing how 'guided' the news networks are. I guess I didn't know this. And FOX News has led the way in this domestically... showing nothing that goes against American nationalism. So that word, nationalism, is what leads me into the next program, Control Room. Better produced perhaps, this documentary covers the war in Iraq in its first year. It shows the different news programs showing very different things: Most domestic news programs showing victories in the war, most Arab programs showing defiance and death. Naturally, this incited a great deal of nationalism in the Arab states. They unified in hatred against the US. This is why so many people think of Al-Jazeera as an "anti-American" network, when in reality, I don't know if it's that simple. I think I noted this in an earlier blog, but perhaps not... either way, I'm saying it again: In a recent report from the British FCC (or whatever it's called), FOX News was in more violations of their journalistic standards than Al-Jazeera. Wow. That is huge for those who think that FOX is the only truly "fair and balanced" news network. I grow tired of the justification of the treatment of prisoners of war (or any prisoners) as animals. I grow tired of the dehumanization of these men by the American public, military and administration. I grow tired of a "Christian" President that does nothing about it. In fact, he makes excuses. And, I grow most tired of the lack of comment from the mainstream Christian media regarding this situation. Besides Christianity Today, I have seen nothing. We print millions of pages on Terri Schiavo and suddenly take Matthew 25 seriously (well, actually the part about sick people, which is a start, I guess). We print millions of pages on activist judges and euthanasia enthusiasts, but allow the government to murder, torture and abuse prisoners with no outcry. Why do we not heed the rest of Matthew 25? Do we as "American Christians" bow at the flag before the cross and allow torture because it "protects us." I mean, Christianity is all fine and good unless it gets in the way of patriotism, homeland security and this administration. To Americans unbothered by our treatment of POWS, I ask them to remember how we felt about the Japanese and Vietnamese treatment of our soldiers in the past. To the Christians (including our President) who say nothing in the face of the abuse of POWS, I ask them to remember the words of Jesus in Matthew 25 "I was in prison and you came to visit me." "When did we see you in prison and go to visit you? I tell you the truth (remember that precious "Objective Truth" we are told about?- my words), whatever you did for the least of these you did for me." Conversely, "I was sick and in prison and you did not look after me." "When did we see you in prison and not help you." "I tell you the truth, whatever you did not do for the least of these, you DID NOT Do for me." We compared Terri to Jesus when she was sick and in need. Do we dare compare the POWS abused by our country to Jesus? Do we respond? "The Last Word And The Word After That"
Brian's newest is on sale for an incredibly low price on Amazon. From the product description: For all those seeking more authentic ways to hold and practice Christian faith, Brian McLaren has been an inspiring, compassionate—and provocative—voice. Starting with the award-winning A New Kind of Christian, McLaren offered a lively, wide-ranging fictional conversation between Pastor Dan Poole and his friend Neil Oliver as they reflected about faith, doubt, reason, mission, leadership, and spiritual practice in the emerging postmodern world. That conversation widened to include several intriguing new characters in the sequel, The Story We Find Ourselves In, as Dan and friends continued to explore faith-stretching themes from evolution to evangelism, from death to the meaning of life. Now, in this third installment of their adventures, Dan and his widening circle of friends grapple with conventional Christian teachings about hell and judgment and what they mean for our relationship with God and each other. Is there an alternative to the usual polar views of a just God short on mercy or a merciful God short on justice? Could our conflicted views of hell be symptoms of a deeper set of problems – misunderstandings about what God’s justice and mercy are about, misconceptions about God’s purpose in creating the world, deep misgivings about what kind of character God is and what the Christian gospel is for? Might you be interested in staying at our place this summer? For a week? or two? or all six? We are also considering throwing our car into that mix. If you are interested at all or know someone who is, please contact me. Thanks. You might want to as well if you live in Southern California. Immanuel Kant (1724-1804) is possibly best known for the "categorical imperative." He believed that there is a transcendent, objective moral/ethical obligation "out there." As human beings, our job is to figure it out, articulate it in contemporary language, and then apply it. G.W.F. Hegel (1770-1831), on the other hand, believed that moral/ethical norms come become known through a dialectical process of practice and reflection. As a result of this process, a "reflective equilibrium" is achieved. So, it seems to me that many of the critics of Emergent at Kantian Christians -- they believe that there is a certain, correct, objective interpretation of God's truth as revealed in scripture and the person of Jesus Christ. If they can just get us to stake our claim, then they can see where we are relative to their position, and then they can label us as "conservative," "liberal," "evangelical," "mainline," "Calvinist," "Arminian," or any other well-established category. Emergent, however, I dare say, is a very loose collection of Christians who are committed to Hegelian dialectical and Aristotelian practical reasoning [thanks, Chris]. That is to say, we want to carve out a place for conversation, dialogue, dialectic, and debate. We also want to place practice at the very center of theology. That is, theology isn't just about getting what we believe right; it's a rich matrix of what we believe and how we live that matters for the Christian faith. We bought our tickets to Thailand this morning. We are over there June 9 - July 20. If you care to join us in person or spirit, please let us know. NPR is starting a new (actually restarting an old) series called, "This I Believe." It is a chance for people to explain the values and principles and perhaps faith that guides their lives. Heard some snippets this morning. If you go to NPR.org and type in "This I Believe" (or just click here) you can write your own 600-word essay and submit it. "This is my youthful philosophy, a simple, liberal and optimistic feeling, though I fear I shall lose some of it as I become more adult. Already, the thought that the traditional thinkers might be right, after all, and I wrong, has made me waver. Still, these are my beliefs at sixteen. If I am mistaken, I am too young to realize my error. Sometimes, in a moment of mental despair, I think of the words, 'God loves an honest doubter,' and I am comforted." It's official: Heather had her baby. Sunday morning at 12:07. She weighed 7 lbs. and 1 oz. Her name is Danielle. Martin and Heather (and us, too) thank all of you who were involved in getting Heather set up... and set up well! Pope John Paul II is dead. Vatican officials have denied that Pope John Paul II has died. Don't know who to believe.